The leaf juice press is ideally suited for extracting juice from plant parts such as leaves, buds, and germs. The two rolls are pressed against each other pulling in the leaves which are furnished to the centre of the rolls. The juice runs down from the slanted rolls, and may be collected on the tip of the lower roll. 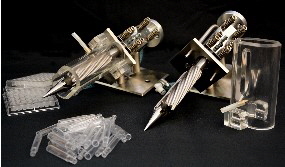 The drops are catched by means of a small plastic tube that must be held against the tip. Especially for working with material of low liquid content, the buffer unit (order no. 1.0204) eases the process of collecting the juice from the rolls. The buffer mixes up with the plant juice to a homogenous mixture. Oxidation of juice is reduced and preservability for a longer period is achieved . For safety reasons, the rolls are surrounded by a plexiglass part with inlet port that simultaneously serves as splash protection. A safety coupling between the rolls and the motor prevents damage of the device when using unsuitable materials. At the end of the extraction process the rolls are cleaned with water by means of a special rinsing nozzle. Water flushing is controlled electronically and is activated by a push button at the side of the press stand. The rinsing time may be adjusted by means of a control knob. 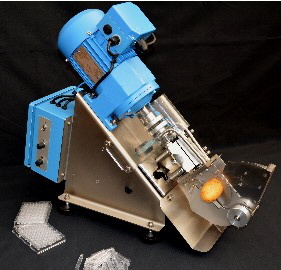 The tuber juice press is ideally suited for extracting juice from tubers (potatos with and without germs). The press is equipped with a corrugated roller system for solid material and a precutting unit. 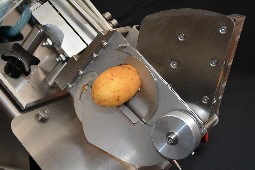 The tuber is fed from the side into the opening of the precutting head. Activating the foot switch starts the cutting process and the buffer unit. The truncated disc is pressed between the roller system. The two rolls are pressed against each other pulling in the material that is furnished to the centre of the rolls. The juice runs down from the slanted rolls, and may be collected on the tip of the lower roll. 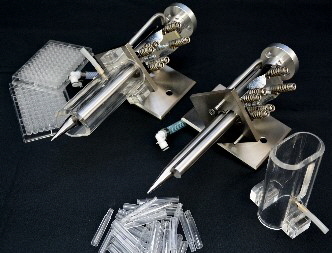 The drops are catched by means of a small plastic tube that must be held against the tip. 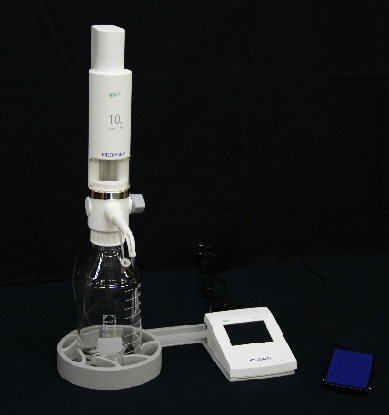 Especially for working with material of low liquid content, the buffer unit (order no. 1.0204) eases the process of collecting the juice from the rolls. The buffer mixes up with the plant juice to a homogenous mixture. Oxidation of juice is reduced and preservability for a longer period is achieved (see specification on page 1/4). A safety coupling between the rolls and the motor prevents damage of the device when using unsuitable materials. At the end of the extraction process the rolls are cleaned with water by means of a special rinsing nozzle. Water flushing is controlled electronically and is activated by a push button at the side of the press stand. The rinsing time may be adjusted by means of a control knob. 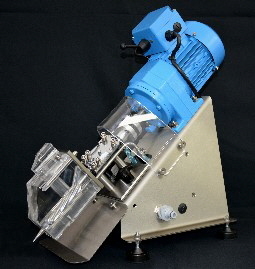 The germ juice press is ideally suited for extracting juice from plant germs. The press is equipped with a corrugated roller system for solid material. At the end of the extraction process the rolls are cleaned with water by means of a special rinsing nozzle. Water flushing is controlled electronically and is activated by a push button at the side of the press stand. 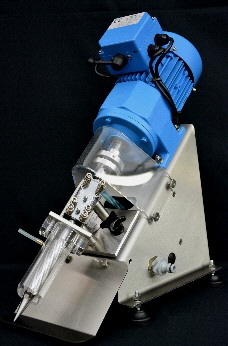 The electronical buffer unit (Dispensor) Hirschmann opus® 10ml is a versatile and compact laboratory device for rapid and accurate liquid dosing. 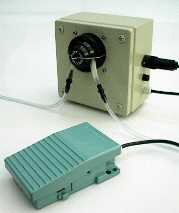 The peristaltic pump is by footswitch operation or in a version with a timer for dispensing liquids for any application purposes. Standard is a pump head with 6mm hose for maximum 560ml per minute. 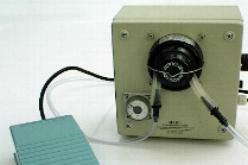 For very low dosage to 50ml per minute 1.5 mm hose is available as an option. 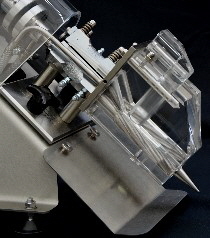 Accordingly by long press on the foot pedal, the dosage over time is arbitrarily controlled. 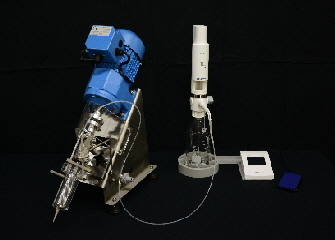 In the version 6.0252, the dosage is controlled via a built-in timer in 16 time ranges from 0.1 sec up to 500h. The pumping process is triggered in this case with the foot switch. The desired amount can empirically or previously determined using the pump speed of 175 rev / min and the tube capacity of 3.2 ml / rev. be calculated at the 6mm hose. not included, conical double hose fitting recommended.